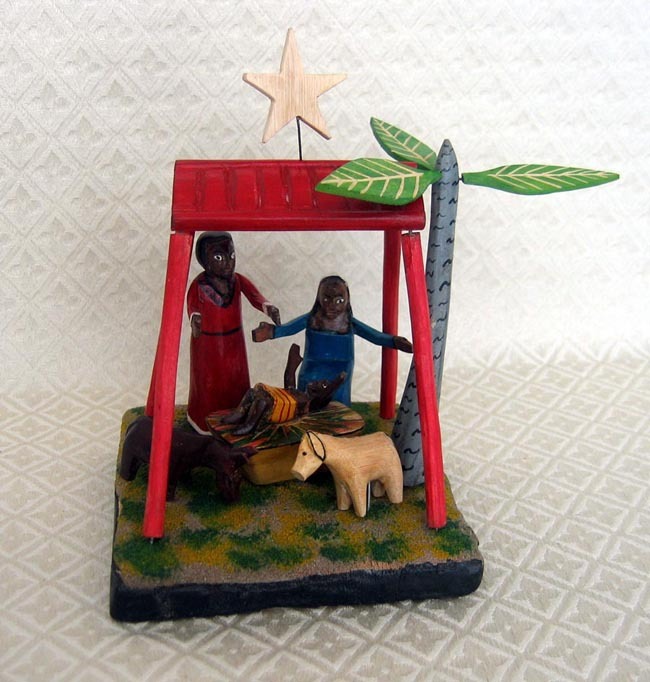 This Nativity set was hand-carved from mafurreira wood by Samuel Baloi of Mozambique. The style of the carving is called Psikhelekedanam, which is a traditional art form from the south of Mozambique initially practiced by people from the Ronga ethnic group. The brightly painted set measures 6 inches to the top of the tree (not including star). Psikhelekedana traditional art consists of the carving of a whole series of objects of wood, whose motivations and uses, forms and colours have varied over time. The wood, very pale in colour, light and easy to work on, comes from the mafurreira, a medium sized tree, which is common in the southern provinces. Roots and branches are used, rather than cutting down the whole tree. Originally the subjects were clearly rural: wild animals, particularly birds, crocodiles, snakes, lizards and giraffes, household objects such as spoons, bowls, and pestles, and masks. There was only one human representation - a warrior with a shield and spear, and wearing animal skins. The wood was hewed with a chisel, carved with a razor, and after scorching or painting with natural colours, engraved. In a second phase, another line emerged, using urban themes: high-rise apartment blocks, cars, motorbikes, radios, in ever more diversified forms and colours. Most recently a group of young people have begun to dedicate themselves to a new thematic and make their pieces representations of moments in the history and life of the Mozambican people. This gives their art a “documentary” function.